The Gist: Two working class New York City couples try to find honesty and intimacy in the cold, dark city winter. The Lowdown: Directed by and starring veteran actor Philip Seymour Hoffman, “Jack Goes Boating” is based on a play and moves to the slower rhythms of the stage. As the painfully shy but good-hearted Jack, Hoffman gives another of his detailed character portraits. Jack works as a limo driver for his uncle’s business, but finds new inner resources when set up on a blind date with Connie (Amy Ryan), another damaged and withdrawn New Yorker. John Ortiz and Daphne Rubin-Vega play the film’s other featured couple, whose long partnership is threatened by secrets and betrayals. Not a lot happens in “Jack Goes Boating,” and what does happen goes down verrry slowly. But if you can adjust to the film’s pacing, you’ll find a moving and funny story of the trials of love. “Jack” excels at evoking that kind of rich, exquisite sadness you can only really get at the movies. Have they invented a name for that feeling yet? The Extras: Deleted scenes, theatrical trailer and two production featurettes concerning the adaptation form stage to screen. The Bottom Line: A subdued but deeply felt love story with amazing performances from the four leads. Double Secret Bonus Tip: Hoffman may be the least vain screen actor ever – Jack is chubby, schlubby, frequently shirtless and failing spectacularly in an effort to grow dreadlocks. Parents with children currently in possession of the handheld Nintendo DS gaming system may be familiar with this dilemma: Sitting in an airport, or standing in a long line, kids are at a distinct advantage. With that little handheld, they can while away hours on end without looking up. I suppose, for adults, that’s what Blackberries, iPhones and Droids are for. But frankly, I’m not ready to be that connected yet. 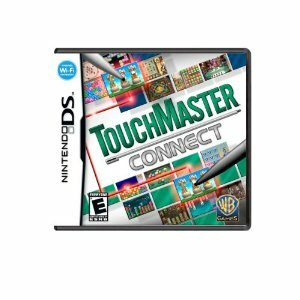 More my pace is “TouchMaster: Connect” (DS, $19.99, Rated E), a collection of 20 mini-games for the DS designed to appeal to the aging old-school gamer out there. “TouchMaster” spans the typical array of mini-game genres – card games, a few strategy and action titles, some trivia – and packages it all together with on-screen tutorials and easy-to-learn control schemes. I dug into this collection quite a bit over the holidays, returning to play probably a dozen of the games more than once. I’m clinically addicted to four or five of them, too, and that’s a pretty decent batting average for a mini-game collection. Most successful are the variations on Bejeweled and Tetris style puzzlers, and the sole included trivia game has a surprising level of depth. One thing I’d have liked to see included – a decent Mahjong game. I can kill days with a decent Mahjong game. As you might expect, “TouchMaster” has some new social networking options that integrate with Twitter and Facebook on the Internet-enabled DSi handheld. Also: online leaderboards and local wireless multiplayer on selected games. I suspect I’ll go the rest of my life without feeling the urge to post my Solitaire high scores online. But then again, who knows? The times, they are a changing. The Gist: Director David Fincher (“Fight Club”) teams with writer Aaron Sorkin (“The West Wing”) to detail the creation of Facebook, maybe the most influential (insidious?) social phenomenon of a generation. The Lowdown: One of the year’s Oscar frontrunners, “The Social Network” is a marvel of modern movie-making. A fictionalized account of the creation of Facebook, the film stars Jesse Eisenberg as Mark Zuckerberg, the brilliant and damaged Harvard student who more or less invented social networking as we now know it. Sorkin’s screenplay features his patented brand of impossibly eloquent dialogue, and director Fincher keeps everything moving along at the pace of a contemporary thriller. The movie is most interesting, however, in its ideas and implications. “The Social Network” might appear to be another morality play about ambition and greed, but what it’s really concerned with is the dramatic flux of modern communication in the digital age. After all the noisy interpersonal drama plays out, you’re left feeling a strange unease. Fincher has threaded his themes of deception and authenticity throughout, and these are the anxieties that linger. The Extras: Two separate commentary tracks with all the major players, plus five more mini-docs on technical aspects of the film. The Bottom Line: A very intelligent drama with a lot on its mind, “Network” also works as a fast and furious thriller. The Gist: A New York City photographer gets involved, via Facebook, with a family in rural Michigan. But when he shows up for a visit, nothing is as it seems. The Lowdown: “Catfish” generated a ton of buzz and conjecture when it first hit theaters. It’s being sold as a legitimate documentary – filmmaker Ariel Schulman just happened to be documenting his brother’s online intrigues when everything went haywire. But some passages seem just too coincidental to be real, while others are too real to be fiction. Avoid all spoilers with this one. As with recent projects like Joaquin Phoenix’s “I’m Still Here” and the Banksy doc “Exit Through the Gift Shop,” it’s possible that all the ambiguity is part of the intent. In any case, “Catfish” is the first film I’ve seen that truly engages with the emotional core of the social network phenomenon. It takes as a given that technology is changing fundamental notions of identity. Then it digs deeper, into the really creepy stuff. The Extras: An exhaustive Q&A with the filmmakers, with questions submitted from curious fans. Double Secret Bonus Tip: After viewing the bonus materials and researching online – rather obsessively, too – I’m convinced that “Catfish” is for real. The Gist: In the third installment of the spooky teen saga, eternally indecisive Bella Swan must finally make her choice between shirtless werewolf Jacob or sullen vampire Edward. The Lowdown: The Twilight saga has clearly struck a chord in the contemporary teenage heart, and who are we to judge? The nice thing is that the films, like the books they’re based on, can be enjoyed on a few different levels. If you want, you can read a lot of allegory into all the blood and guts and body hair issues. “Twilight” basically turns teenage emotional trauma literal – your boyfriend, in these stories, might actually rip your heart out. Or horror movie fans can just sit back and enjoy the updates to vampire and werewolf mythology. The Extras: Audio commentaries with stars Robert Pattinson, Kristen Stewart and author Stephanie Meyer; deleted and extended scenes; six-part making-of doc; some music videos and a handy option for Team Edward and Team Jacob to jump directly to their respective scenes. The Bottom Line: Much better than it’s strictly required to be as a teen entertainment franchise, “Eclipse” is generous and occasionally scary.